Yes, there are Eichler homes in New York! They are sometimes called “lost Eichlers,” as most of noted mid-20th-century developer Joseph Eichler’s homes exist in Northern and, to a lesser degree, Southern California. 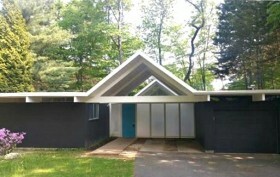 Three custom-built Eichler houses were constructed (and still stand) in the Rockland County, New York community of Chestnut Ridge, just north of Eichler’s hometown of New York City. Joseph L. Eichler, whose modernist tract homes can be found throughout the Bay Area in Northern California as well as the Greater Los Angeles area, was one of the most celebrated residential homebuilders of the mid-20th century. 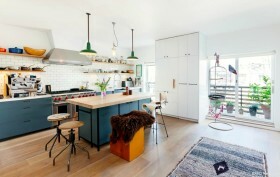 His homes are enthusiastically “collected” by modern design buffs, and their renovations appear on the covers of design and home decor magazines like Dwell and Metropolitan Home. 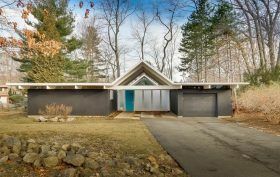 The listing says this undeniably out-of-the-ordinary home at 130 Grotke Road in a wooded Rockland County, NY community is “Not for everyone except you!” Which means Eichler fans and modern house lovers will want to take note: This could be your chance to scoop up a modern classic for half the price of its California counterparts. 6sqft previously featured the rare trio of East Coast Eichlers and the story of their rise to popularity during the dawn of the American suburban heyday—and plans to expand to the East Coast starting with three homes in the quiet community of Chestnut Ridge. Inevitably weather conditions and other factors led to a decision to return the focus to the West, but those three homes have not only endured—they have encouraged a community of modern architecture lovers to grow around them. One of those three homes—a four-plus-bedroom, 2,000-square-foot 1962 slate grey beauty—is now on the market for $489,900. After five long years on the market, the William Lescaze-designed townhouse at 32 East 74th Street on the Upper East Side has found a buyer, according to Curbed. As 6sqft previously reported, Lescaze was a Swiss-born, American architect who is credited with pioneering modernism in America. His personal Midtown East townhouse (the William Lescaze House) is considered the first modernist residence in New York City, built just one year prior to this 1934 uptown commission. The Upper East Side house sold for $12 million in 2008. Starting two years later, it’s been on and off the market, ranging from $14 million to $19.5 million, but finally went into contract last week for $15.9 million.